Recent Ford predictions that the U.S. auto market’s growth would quickly slow in the second-half of 2016 put a damper on the mood of an industry which achieved a record-setting pace in the first-half of 2016. During the first six months of the year, U.S. auto sales volume was 1.4% ahead of the pace set during the first-half of 2015, a banner year for the U.S. auto industry. But May sales declined and June volume was up just 2% as Acura, Volkswagen, Mini, Chrysler, Fiat, and BMW all posted double-digit losses. And now auto sales in July 2016 increased by less than 1%, a gain of 11,000 units following an increase of 75,000 units in July 2015. A marked slowdown at the Ford Motor Company which resulted from a 5% decline at Lincoln, a 10% Ford passenger car sales decline, a 5% drop of Ford SUVs, and a modest 1% Ford F-Series decline ably represented the industry’s story in July. U.S. auto sales flatlined, lending credence to Ford’s warnings. General Motors, the biggest seller of new vehicles in America, suffered a 2% July drop, though the rate of decline wasn’t as steep as in the first-half of 2016. Buick posted a 10% increase thanks to 1421 Envision sales, improved Enclave and Encore volume, and a Regal surge. FCA’s report of a 0.3% increase comes after the company revealed that, for years, their reporting methods produced falsified results. As a result, the figures shown here for FCA and its various brands (Jeep, Chrysler, Dodge, Ram, Alfa Romeo, Fiat) are not the sum total of six prior months plus July. The company has employed a new methodology for reporting auto sales. Despite a 5% Infiniti drop and a 9% passenger car decline at its namesake Nissan brand, the overarching Nissan USA empire posted a 2% July increase. Thank pickup trucks, Rogue, and Murano. 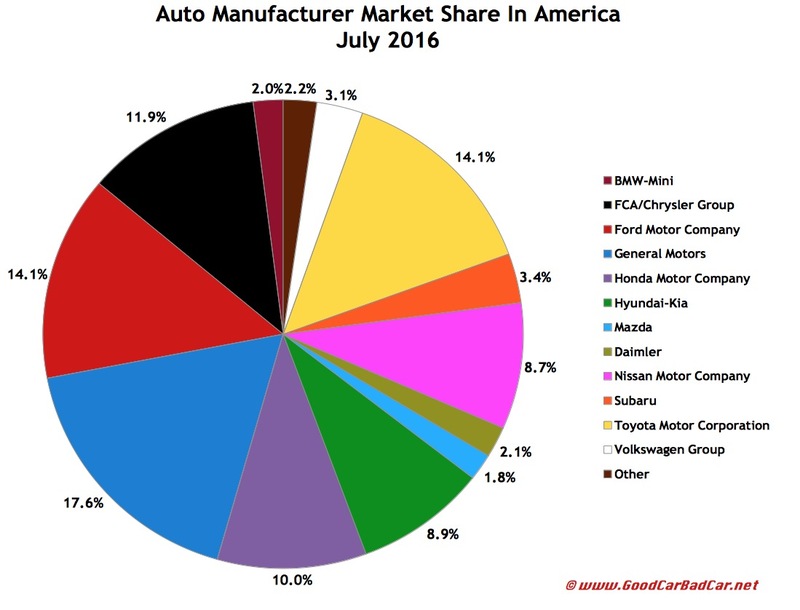 American Honda, which was outsold by the Nissan/Infiniti duo through the first seven months of 2016, nevertheless produced strong July results which pushed Honda/Acura well past Nissan. Civic, Fit, CR-V, HR-V, Pilot, and Ridgeline sales all improved. Toyota USA’s 2% decline at the Toyota brand and a 7% Lexus drop negated the 66% increase at soon-to-be-defunct Scion. The bright light? The Toyota RAV4 and Highlander both reported best-ever July sales. Hyundai, first to report, said July 2016’s 75,003 sales represented the brand’s best July ever. Together, because of a 6% increase at Kia, the Hyundai-Kia Korean conglomerate outsold traditonally higher-selling Nissan MoCo in July. Mercedes-Benz topped all luxury brands and leads the year-to-date race by nearly 12,000 sales. The Ford F-Series was America’s best-selling vehicle, though the Ford full-size truck lineup didn’t generate as many sales as GM’s full-size twins, combined. The Toyota Sienna was America’s top-selling van; the Toyota Camry grabbed top car honours for a third consecutive month. 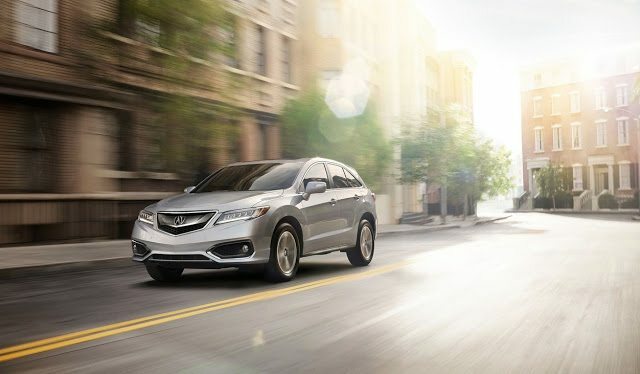 The Honda CR-V surged to a best-ever performance of more than 36,000 sales to end July as America’s top-selling SUV/CUV. No auto brand reported greater year-over-year growth in July than Jaguar, which is bearing the fruit of the F-Pace and XE launches. Soon-to-be-defunct Scion, Volvo, Jaguar’s Land Rover partner, Smart, and Buick produced double-digit percentage increases. A bunch of Italian and Fiat-related brands posted notable decreases: Ferrari, Maserati, Fiat, Alfa Romeo, and Dodge’s losses were among the most significant in July. Ford, Toyota, and Chevrolet – America’s biggest brands – all declined, as well. There’s more information on specific brands after the results table. If you don’t wish to see automakers arranged alphabetically, click column headers to sort automakers by July sales, year-over-year change, year-to-date totals, or any other order. Best seller lists for cars, trucks, and SUVs will be added later this afternoon. In the coming days, GCBC will also publish a complete list of year-to-date sales for every single vehicle line, a list which includes brand results. (Check out the 2015 version here.) You can always find historical monthly and yearly sales figures for any brand by clicking the brand name in the table below or by selecting a make (or model) at GCBC’s Sales Stats page. ^ Excluding Sprinter: up 3.6% to 28,523 in July; down 0.6% to 191,300 YTD. 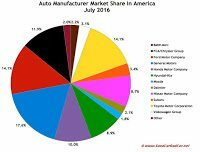 ° Alfa Romeo, Chrysler, Dodge, Fiat, Jeep, Ram WSJ estimate for Tesla: 3300 in July; 19,800 YTD. Mazda’s 3% improvement, despite a 7% year-to-date drop, occurred with strong utility vehicle volume: 1499 CX-3s, a 41% CX-9 uptick, and the CX-5’s best ever July. 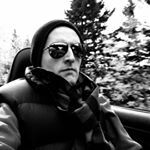 Volkswagen, meanwhile, tumbled 8% because of a sharp 20% drop in Golf sales, a 34% Beetle decline, and losses from the Jetta, Passat, CC, and Touareg. Volkswagen’s upmarket Audi brand, on the other hand, rose 4% thanks to increases from the A4, Q3, Q7, R8, TT, and top-selling Q5. Mercedes-Benz’s GLC, GLE, GLS, and G-Class gains offset B, CLA, C, E, S, SLC, and SL losses to produce a 4% July gain for the luxury division. Mercedes-Benz, with Lexus down 7% and BMW down 4%, was the top-selling premium brand in America in July and through seven months of 2016. Subaru reported a 56th consecutive year-over-year month of growth in July 2016. Subaru says the company has now sold more than 10,000 Outbacks in 29 consecutive months and more than 10,000 Foresters in 36 consecutive months. Volvo sales surged 53% ahead of July 2015’s pace largely because of 2888 XC90 sales, though S60 volume was up sharply, as well.